A new exhibit featuring James Rogers Mapp is on display at the Bessie Smith Cultural Center in Chattanooga, Tenn., Tuesday, Aug. 8, 2017. Mapp led the longest-running lawsuit in local history, attempting to end segregation in the Chattanooga public school system. 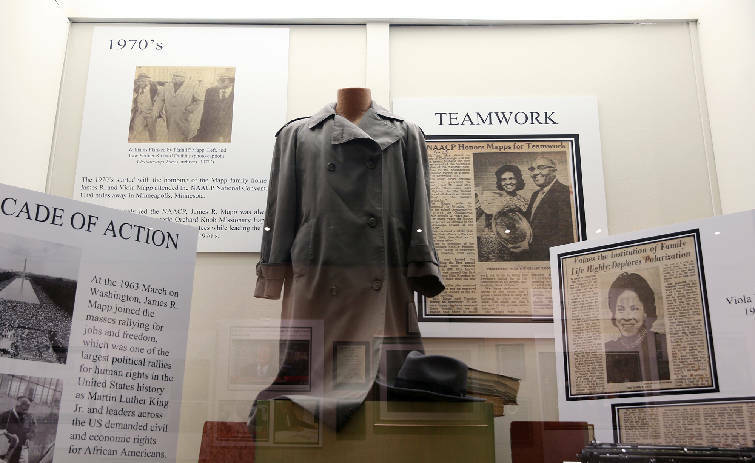 A jacket of James R. Mapp's is one of the items on display at the Bessie Smith Cultural Center in Chattanooga, Tenn., in an exhibit honoring Mapp Tuesday, Aug. 8, 2017. An opening reception will be held for the exhibit titled "Chance or Circumstance?" on Monday, Aug. 14, 2017 at 5:30 p.m.
A new exhibit at the Bessie Smith Cultural Center honors a man who fought until his death to make life better for African-Americans in Chattanooga. James Rogers Mapp (1927-2015) led the longest-running lawsuit in local history, attempting to end segregation in the Chattanooga public school system. When U.S. District Court Judge R. Allan Edgar dismissed the 26-year case in 1986, stating that unlawful segregation in the local public schools no longer existed, Mapp continued to voice opposition, listing several schools that were disproportionately populated by race and that lacked resources. He demanded until he died that African-Americans have equal rights. To honor his legacy, his family and the Bessie Smith Cultural Center will host a free, opening reception for "Chance or Circumstance? — The James R. Mapp Exhibit" on Monday, two days before what would have been Mapp's 90th birthday, Aug. 16. "The many accomplishments that he made to Chattanooga are very important, especially to our young children," said Dionne Jennings, president of the Bessie Smith Cultural Center. "To see that someone from their community reached such great heights that they can aspire to do and be whomever they choose." The display runs through Oct. 31. The exhibit derives its name from the title of Mapp's book, "Chance or Circumstance? A Memoir and Journey Through the Struggle for Civil Rights." Mapp wrote the book over the last eight years of his life, though he died before it was published. He credits Dr. Barbara Medley with editing the book; she died in 2013 before it was complete. Two of his daughters, Brenda Mapp Hackett and Michaellee Duckworth, finished editing it and got it published. The book was named Memoir of the Year in the 2017 Indie Author Legacy Awards, which honor "unsung heroes" whose nonfiction is geared toward social awareness, education and personal transformation. "I hope they learn about his dedication to the community, to his people, for making sure that they had all of the privileges that anyone else would have in housing, education, voting rights, etc.," says Hackett. Mapp filed the landmark lawsuit, Mapp v. Board of Education, in 1960. Chattanooga schools integrated a year later. But that was seven years after the U.S Supreme Court decided in 1954 in Brown v. Board of Education that state-sanctioned segregation of public schools was a violation of the 14th Amendment and was unconstitutional. › When: 5:30-7:30 p.m. Monday. Exhibition continues through Oct. 31. › Where: Bessie Smith Cultural Center, 200 E. M.L. King Blvd. › Museum hours: 10 a.m.-5 p.m. Monday-Friday, noon-4 p.m. Saturday. › Admission: $5-$7; admission is free to the opening reception. › Note: Mapp’s book, “Chance or Circumstance? A Memoir and Journey Through the Struggle for Civil Rights,” will be available for $28.95 and $18.95. The father of eight stepped into the fight for civil rights determined to make life better for his children and community. His quest for equality and leadership in the NAACP drew opposition that led to death threats and his house being bombed in 1971. No one was physically injured in the attack. More than a dozen panels at the entrance of the Bessie Smith Cultural Center depict Mapp's life story. 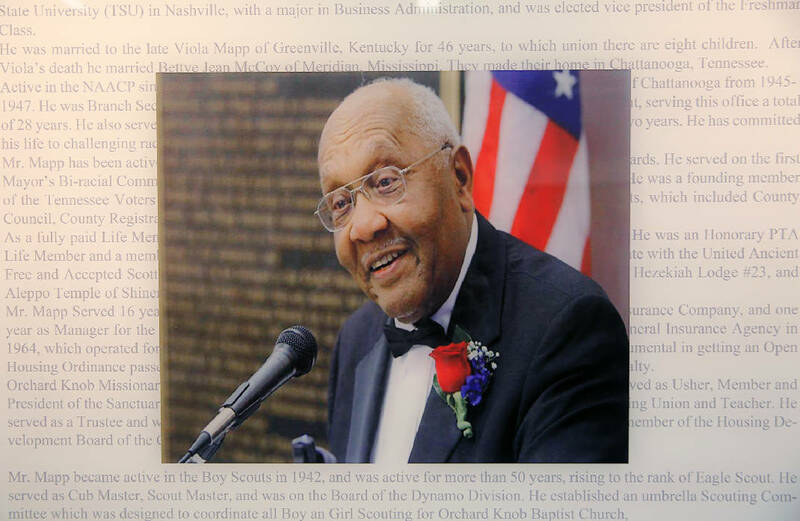 It reports him graduating as class president and valedictorian from Howard High School in 1947 and attending A&I College, now Tennessee State University. It discusses his marriage to the late Viola and then to Bettye Jean Mapp. And it reports about the decades he led the NAACP. Other panels illustrate moments with the Rev. Martin Luther King Jr., the James R. Mapp Building rededication in April 2016 and the recently developed neighborhood at Midland Pike named Mapp Estates in his honor. Another shows his tombstone, which includes one of the statements by which he lived, says Hackett. It states, "We all had a deep and abiding faith in God and feared doing nothing more than doing something." Contact Yolanda Putman at yputman@timesfreepress.com or 423-757-6431.